Wheat Halwa or Gothambu Halwa recipe is an easy halwa recipe. It is indeed a tasty and healthy sweet item. It can be served in all occasions undoubtedly. 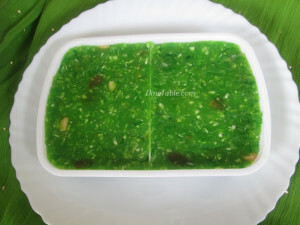 This colourful green gothambu halwa surely attract everyone. Wheat is one of the most important food sources in the world. Wheat is very low in Saturated Fat, Cholesterol and Sodium. It is also a good source of Dietary Fiber.Wheat grains are used to make flour, which is transformed into dough and then breads, which is a staple food in nearly every country and culture. Eating whole grains is advisable to women for staying slim and healthy. It is rich in protein and provides a daily requirement of energy. Serve your family the tasty and nutritious sweet dish made out of wheat that make every occasions memorable.Try and enjoy this tasty wheat halwa. Heat ghee in a frying pan on a low heat. Add the wheat flour and stir continuously. Then add sugar, food color, grated coconut and hot water. Stir continuously. Then add cardamom powder, fried cashew nuts and mix well. Stir continuously till it thickens. Switch off the flame and transfer it into a greased pan. Let it cool down and cut them in to pieces as any shape you like. Tasty Wheat Halwa or Gothambu Halwa is ready to serve .